Probe around in Sterling Archer’s subconscious and, logic would dictate, there will be beautiful women in stylish clothes, a steady flow of pills and alcohol, and trouble, plenty of trouble—much of it imposed on him by his mother, the rest by his own stubbornness and sangfroid. The series’ eighth season, Archer: Dreamland, explores the comatose mind of Archer, who was last seen doing his best William Holden, face down in a Hollywood swimming pool. Adam Reed, the mastermind behind the animated series, has created an inspired season that takes the obvious presumptions about life in Archer’s brain and warps it into something wholly new yet quintessentially Archer. Even the opening credits and music have been re-worked, and yet remain instantly identifiable, with the silhouetted images reflecting each character’s new persona (Aisha Tyler’s Lana Kane is now a jazz singer, for instance). “Adam is great at finding a way to keep the narrative going and at same time changing everything up,” says H. Jon Benjamin, who voices Archer, tells Paste. Previously, the show was purposely vague about time, sometimes seeming to be set simultaneously in the present and in the 1960s, 1970s or 1980s. 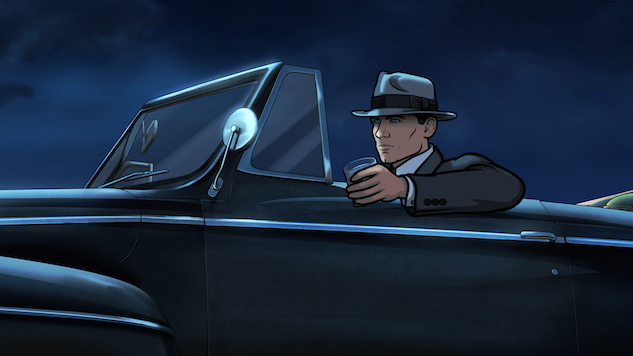 Dreamland takes Archer to 1947, where he is a private eye. “I don’t ever have the expectation of Cyril being a hero, so it’s fun getting to be a bad guy,” Parnell says. Archer then ends up being manipulated by an ambitious rival mobster, who owns a club called Dreamland: That mobster is named Mother and is really Archer’s mother, Malory (Jessica Walter). Archer is also caught up in a fake suicide and several real kidnapping attempts involving Cheryl (Pam Greer), who is now a femme fatale and the heiress to a great publishing fortune. Ray Gillette, voiced by Reed, is the bandleader at Dreamland, where Lana sings, and Krieger, played by Lucky Yates, is still a mad scientist, though his storyline has one of the most surprising plot twists in TV this season. There are numerous references to classic noir films: One early episode features a perfect parody of the greenhouse scene between Humphrey Bogart’s Marlowe and General Sternwood in The Big Sleep. Despite all the changes, the essence of Archer remains in the characters and the universe Reed has created. Since the season really exists in Archer’s mind, Reed says, “we wanted to bring back the other characters who would be bouncing around in his brain,” which means guest appearances from Patton Oswalt, Keegan-Michael Key (who previously played Los Angeles detectives) and Tambor. The latter is a classic Archer touch, since it’s conceivable that Trexler is Archer’s father and because Tambor and Walters were famously paired up as the heads of the dysfunctional Bluth clan in Arrested Development. “I can’t shake him and he can’t shake me,” Walter says of her frequent co-star. Archer: Dreamland premieres tonight at 10 p.m. on FXX. Stuart Miller has written about television for the Los Angeles Times, Newsweek, The Guardian, The New York Times and others. He lives in Brooklyn and has been letting his teenage sons watch Archer since it started, much to his wife’s chagrin.